In a very sloppy 17-16 opening day victory over the Browns, the Eagles offense was anemic. Most of the reaction following the game was negative with quarterback Michael Vick taking much of the brunt of it (as he should). Aside from Vick’s questionable decision making and carelessness with the ball, there were actually some bright spots for the Eagles that they can take with them heading into next week’s home opener with the Ravens. The most notable positive to come out of Cleveland yesterday was the defense. (Disclaimer: Yes, I am fully aware they were facing a rookie QB and rookie RB but they can’t do anything about that). First, the linebackers were not a gapping hole like last year. OLB Akeem Jordan and new MLB DeMeco Ryans tied for the team lead with five solo tackles. Ryans was all over the field yesterday and was clearly taking a leadership role amongst the defensive players. Rookie OLB Mychal Kendricks showed why the Eagles are so high on him. He was lightning quick on the field making four solo tackles, five total tackles and playing well in pass coverage. The tackling across the board was a significant step forward from 2011. Browns RB Trent Richardson looked to be a little shaky follow August 9th knee surgery as he was slow to the line of scrimmage but, when he did make it out of the backfield, there was not much running room anyways as the Eagles defense swarmed the ball carrier. The secondary stepped up in a big way. Outside of a poor first play from scrimmage, CB Nnamdi Asomugha looked strong yesterday in press coverage. Asomugha made a touchdown saving tackle after running from the other side of the field to hit WR Travis Benjamin. In addition to physical play of Asomugha, he also defended three passes. Yesterday he looked like the guy everyone was expecting when he signed in Philadelphia in July 2011. Dominique Rodgers-Cromartie had a great game in his first game as an Eagles starting cornerback. DRC defended four passes and had two interceptions. With the exception of one play where he got beat but Browns QB Brandon Weeden over threw his receiver, DRC was beyond solid in press coverage. Safety Kurt Coleman looked phenomenal in the secondary. He came up and helped in the run game (despite being run over by Richardson, he still made the tackle). Coleman had five solo tackles and two huge interceptions. The first interception came off a tipped ball at the goal line. The second ended the game after Coleman picked off Weeden on the first play after the Eagles took a 17-16 lead with 1:18 remaining in the game. On special teams, Chas Henry showed everyone that the Eagles made the right decision by cutting Mat McBriar. Henry punted six times and averaged 55 yards on his punts. He had three punts of 60 yards or further with his longest being a punt of 62 yards. His shortest punt was 41 yards that he put inside the Browns 15 yard line. On offense, despite the constant penalty flags and Vick’s questionable decision making, there were two players who stood out among the Eagles. Wide receiver Jeremy Maclin led all Eagles receivers with seven catches for 96 yards and a touchdown. In order to get into scoring range with less than two minutes left in the first half, Maclin pulled in a 46 yard pass from Vick to bring them into Cleveland territory. Vick rewarded Maclin by connecting with him on an 18 yard touchdown pass after Maclin faked Browns CB Joe Haden badly to get wide open in the endzone. Maclin didn’t play perfect as he had a ball go through his hands for an interception but, overall, he had a very good game for the Eagles. 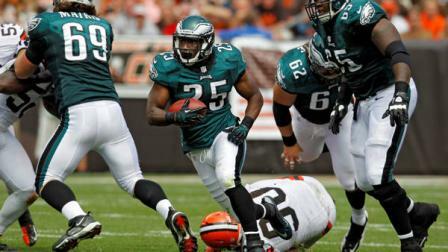 The best game on offense, perhaps for the entire Eagles team, came from RB LeSean McCoy. McCoy rushed for 110 yards on 20 carries with his longest run being just 22 yards. He averaged exactly 5.5 yards per carry. McCoy rushed for 110 yards despite having two long runs called back for holding. When McCoy was getting consistent touches (which wasn’t often enough) the Eagles offense had balance and it opened up the passing game. These bright spots will not be enough to get the Eagles past the Baltimore Ravens next Sunday at Lincoln Financial Field. Vick needs to be better with his blitz recognition and his decision making. The coaching staff needs to do a better job of mixing McCoy into the offense as 20 touches simply is not enough and 56 pass attempts from Vick is entirely too much. The 56 pass attempts allowed Vick to get hit 19 times, which are the most hits any QB has taken since the beginning of 2010. The Eagles win over Cleveland wasn’t a total loss with the play of some of these players but they left themselves with plenty of room for improvement.